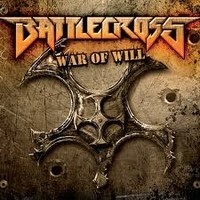 Review: "Battlecross: War of Will" - Sea of Tranquility - The Web Destination for Progressive Music! Battlecross is an awesome band. I recently saw them perform at the Rockstar Energy Mayhem Fest and was deeply impressed. When they hit the stage, they did so with the kind of aggressive force that comes from people who not only love metal but are lucky enough to perform it for others. Lead vocalist Kyle "Gumby" Gunther is a terrific frontman, not a diva, just someone connected to the audience, even getting off the stage at one point and letting the fans heft him up for part of a song. Tony Asta, one of the band's two guitarists, performs with a huge smile; he clearly loves performing and connecting with fans. The other guys in the band�Don Slater on bass and Hiran Deraniyagala on guitar�are no mean slouches either. Deraniyagala contributes mightily to the band's slick and polished twin guitar harmonies (and solos!) while Slater's bass provides plenty of strong low-end punch. I'm not sure who they have on drums right now, but he is relentless. Just listen to the way he drives the beat on this album. War of Will, the band's second album, is an unrelenting musical force, completely avoiding the curse of the sophomore slump. As most people know, the problem with many second albums is that they come out too quickly, an offering to the marketplace rather than to the fans. Such albums are usually weak and uninspired, barely holding the promise of a strong debut. This album shows no sign of a slump. From beginning to end, it offers up a strong metal attack, one characterized by some of the best recent twin guitar harmonies I've heard lately. I love guitar harmonies and praise them regularly. These guys, though, are a cut above. Their guitar sounds, clean, tight, and solid, sound like a musical love letter to all the famous guitar duos out there. Even better, these guys make the sound their own, burning through each part as though they are playing on borrowed time. The solos are also amazing without suffering from too much ego, the desire to show off. "Gumby" Gunther's vocals are mostly screeched. I like his voice and greatly admired his performance on stage. On the album, his vocals have a deeper double, a guttural growl that underpins certain dramatic moments. I'm not sure who performs the vocals, but they add a strong layer to the music. Honestly, I wouldn't mind just listnening to Gunther's wailing screech, but the low end growls help make the point that these guys aren't messing around. Instead of the typical alternating between clean and dirty vocals, these guys alternative between dirty and dirtier vocals. Good stuff. Battlecross is bound to make a strong impression with this album and are one of the best up-and-coming American metal bands right now. As I write this, War of Will is already showing chart success and will no doubt continue to gain positive attention. It is deserved. This is a solid new release, one that will stay on my personal playlist for weeks to come. Album highlights include "Force Fed Lies," "My Vaccine," "Ghost Alive," and "Wage a War. "Check these guys out.